The 1.5kW FL Series 'Floating Output' high voltage programmable DC power supplies from Glassman Europe features fully floating outputs which can be biased as either positive or negative output supplies. 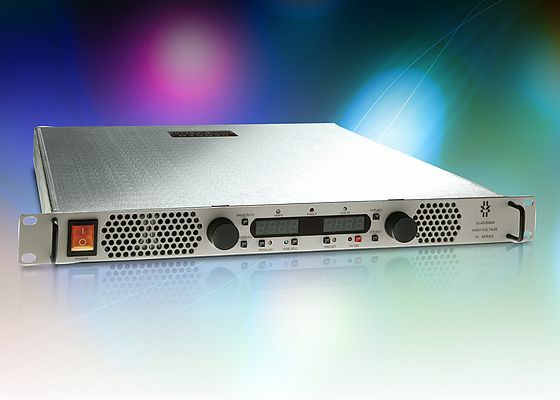 It provides high power density of 1.5KW in a 1U package, not typically seen in power supplies above 600V and therefore allows design engineers more flexibility, particularly when space is at a premium. Robust in design, the device can withstand demanding industrial applications such as plasma coating or ion sources, together with laboratory environments of all kinds. Available in 750Vdc, 1000Vdc, 1250Vdc and 1500Vdc variants, the power supplies include a universal (90 - 264Vac) input. Either output terminal can be grounded for operation as a positive or negative supply. Front panel digital encoders provide high resolution local adjustment of voltage and current program. The embedded microcontroller and built-in RS-232, RS-485 and USB communications - a standard feature on all models in the series - provides remote control programming and monitoring with 12 bit accuracy. Ethernet is also available as an option. Full analogue capability has been retained and the user can select 0-5V or 0-10V analogue programming and monitors if desired.